‘Pure Cult’ Straight in at number one! "I believe it was our only true #1 album... 'Pure Cult' in 1993 and straight in at the top of the British charts. Normally the charts were shall I say "biased" towards the major labels and their major pop stars 'du jour' who somehow magically managed to pip us "underground" bands to #1 despite the "mid week" chart position showing us at #1!!! They always used to say "oh normal folks buy albums on Saturdays so thats why you always end up a bit lower!!" ... 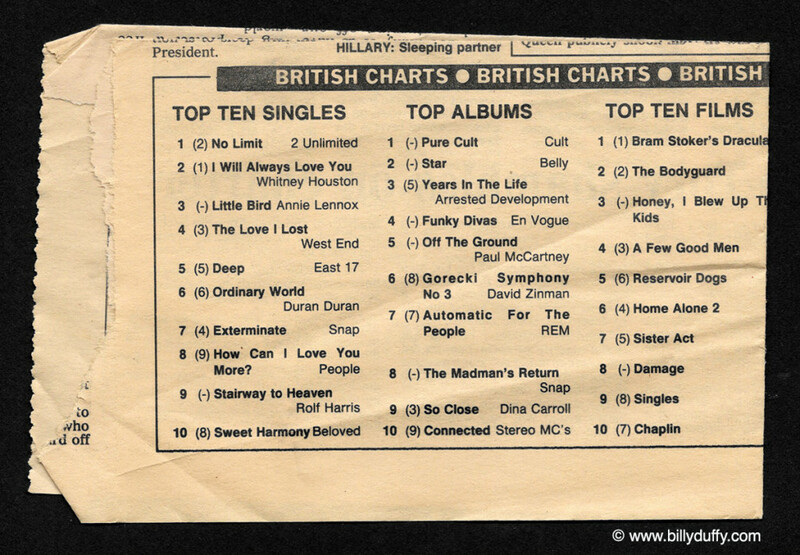 I tended to feel the icy hands of payola myself... but thats just my personal opinion... at least we did get a real uk #1 .... and my mum saved this clipping to prove it!"